Hello, my all time dearest readers! Here I am, once again, writing about one of my favourite affairs. This time it is a look that's all about witchy vibes, aren't you excited? I am! 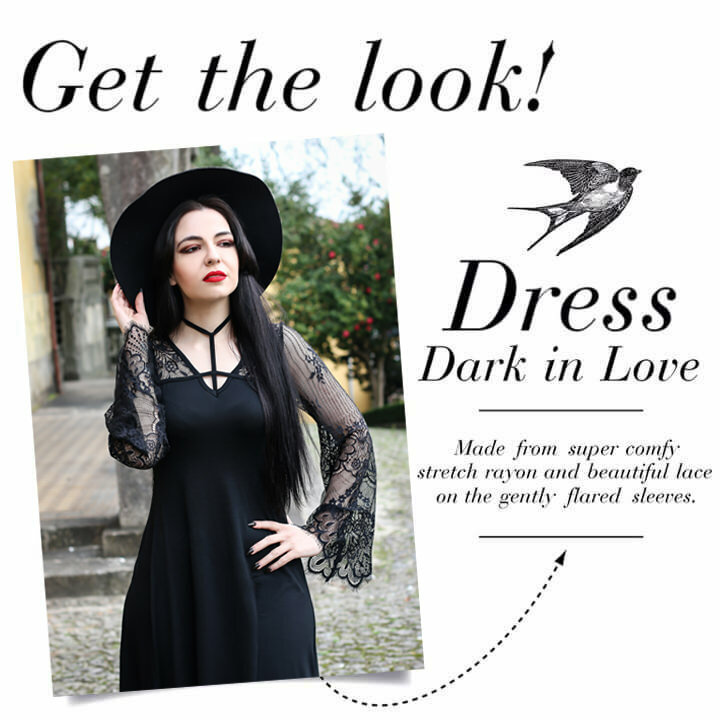 Let's start with the centre piece of this look, that is of course this simple, yet amazing, dress from Dark in Love. Have you checked out their new collection? It's totally worth it, witchy vibes all around! This dress is made from a super comfy, stretchy rayon and gently flared sleeves from beautiful, soft lace. Point of interest are the straps across the chest, like a harness, that tie around the neck. This piece is a perfect match for Spring days! I just wished that the dress is a bit shorter (short girls problems, right?). I know a lot of you will ask about the hat, am I right? It was borrowed for the photoshoot and it is a no name brand. In truth, I don't own a single hat. Fact I need to change quickly, as I deeply appreciate how they turn any simple outfit into something more unique and chic. This cute, little sparkly bat wing handbag is designed by Sourpuss. I got mine from the one and only, The Gothic Shop. It features a black glitter vinyl bat wing design at the front and a silver chain handle with matching black vinyl shoulder strap. It is the perfect size for girls, that like me, love to carry half of their belongings with them every day. Because let's face it, we might need anything anytime! The interior is super wide and has a cute spiderweb pattern lining. Two open pockets and one pocket with a zipper keep the bag super organised. One thing I did differently than my usual routine with this look was, the make up. Usually, I prefer darker tones of eyeshadow but, I really wanted to try something different. So, I took the risk and purchased the Urban Decay Naked-Heat palette. And, I'm so in love! This palette is everything! Pigment is so good and so easy to work with, both matte and metallic shades are so beautiful. I can't recommend this pallette enough! I also tried a Sephora liquid lipstick for the first time, and it is surprisingly good. The shade is one of the most amazing shades of red that I ever used and it still looks good after hours of weare. I'll let you in on some of the products I used for my make up look. Velvet is all I need! Gothic and Amazing 2017 calendar! A thank you gift for my lovely readers! Head-over-heels in love with gothabilly style! Me in white, can you imagine? 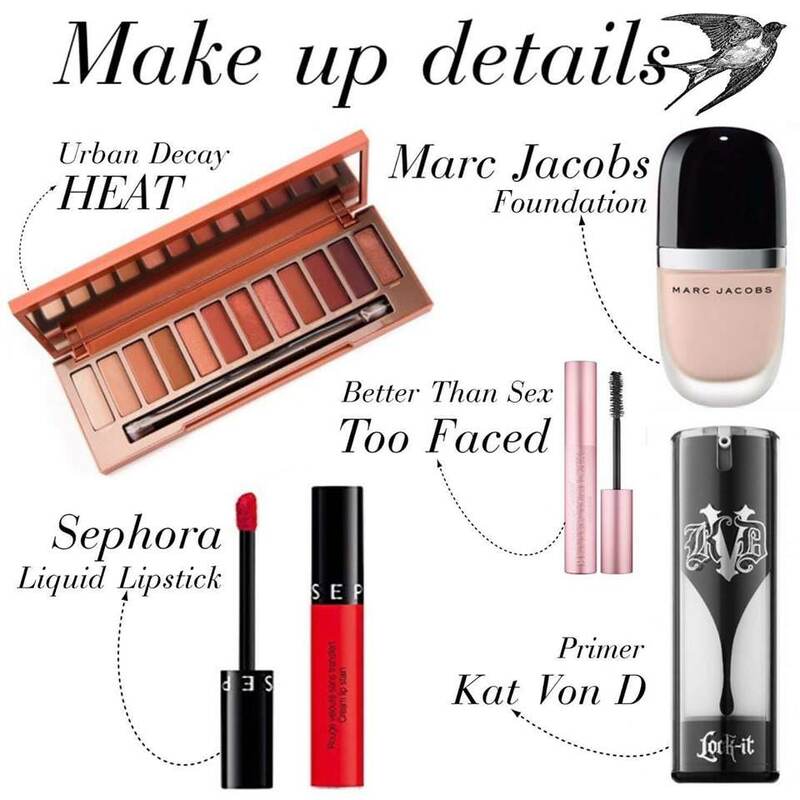 You can rock this look on a date!